(Audio) Getting ready to leave Punta Arenas, Chili. [Nov. 30 2008] Blog: On Antarctica ! 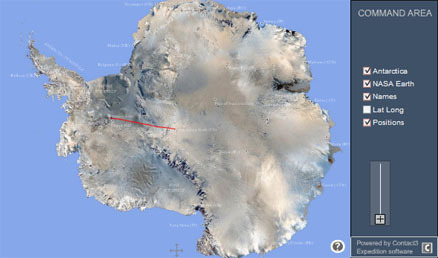 [Dec. 11 2008] Blog: 16 More Nautical Miles (30 kms) Closer to the South Pole !! [Dec. 18 2008] Blog: One of our favorite numbers ! [Jan. 6 2009] Blog: Day 32 - Now we're moving!